Tucked neatly up the beautifully named Horseleydown Lane only a few hundred yards from London bridge walking into The Anchor Tap feels like stepping through a time warp and into another century. I don’t imagine the layout or the style of décor has ever really changed and the wood panelled front bar sets the scene well for what the rest of the pub has in store. It’s a tiny labyrinth of small rooms festooned with black and white photos depicting the development of the area since the pub opened. Extremely low doorways make this a risky venue for anyone of normal stature but if you’re freakishly short or a midget then this is a definitely the pub for you. A piano sits in a room just off the main bar and you can easily picture the ivories being tickled by a moustached old gent whilst a merry crowd of half drunk air raid wardens belt out a few sing-a-long war classics. Though they weren’t lit when I visited there are grates for coal fires which would make for a very welcome addition to the pub on a cold day. There’s also a fairly large seating area outside making this a good spot for a bit of summertime drinky drinky. Booze offering is pretty solid; it’s a Sam Smiths pub so you can’t really go wrong. Given its location it really is incredibly cheap as Sam Smiths pubs reliably are but bear in mind that you’re in the epicentre of so many major landmarks and your pint will taste twenty times better for costing a mere few quid. 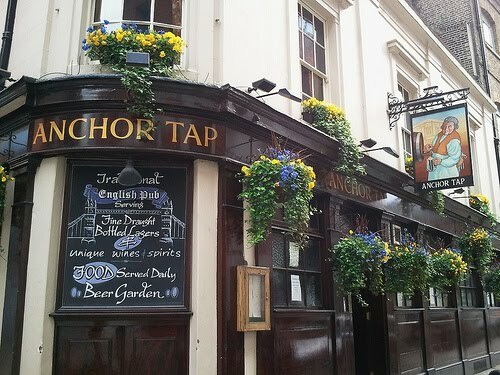 I enjoyed my pint here and would suggest swinging by if you’re heading to the Tower of London or Tower Bridge, it’s literally just around the corner and is a calming slice of unsullied British publiness.